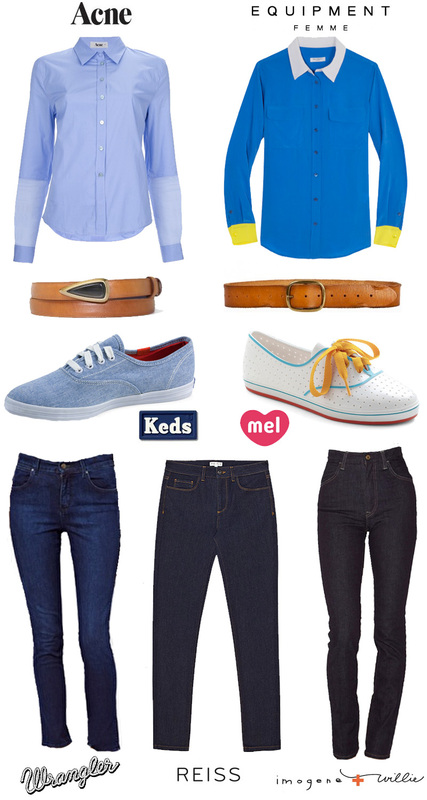 Blue button-ups have had a bit of a makeover in the course of 30 years; Acne and Equipment make my favorites. 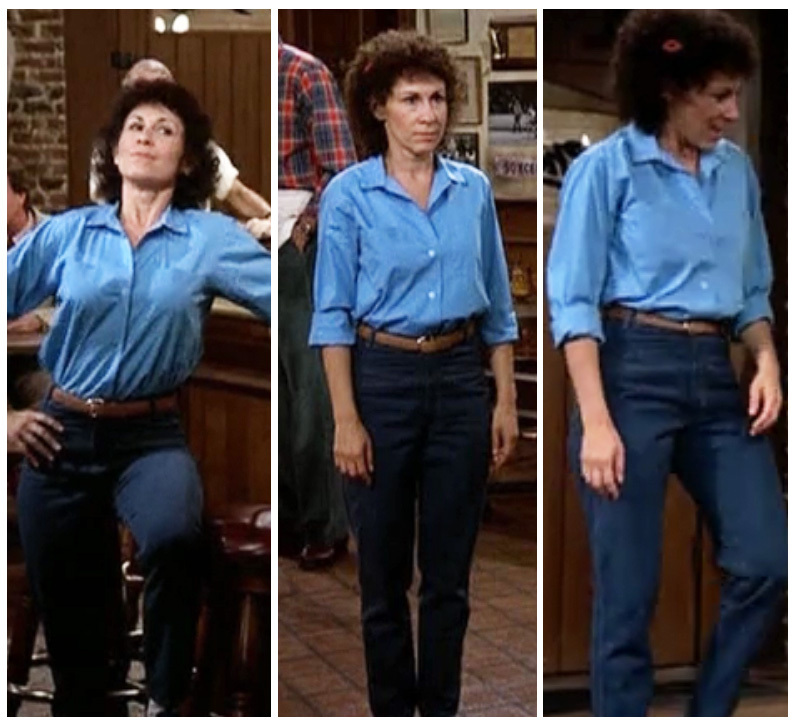 Based on the color and cut of Carla’s jeans, I would think they were Wranglers (though my mom insists Girbaud was the leading brand in 1982). Turns out Wrangler still makes a nice indigo wash jean, as does Reiss (You know it’s the right era when the jean is called “Farrah.” I swear I don’t try to make these things rhyme. ), and Imogene & Willie, a brand I was turned on to by Anne Sage, who called them a “Denim Game-Changer.” They say the Elizabeth jean “sits higher on the waist for new-meets-old-fashioned feel.” Sounds like they heard my plea. And finally, the feet. It drives me crazy that we rarely get to see Carla’s shoes, so I just had to use my imagination. 1. 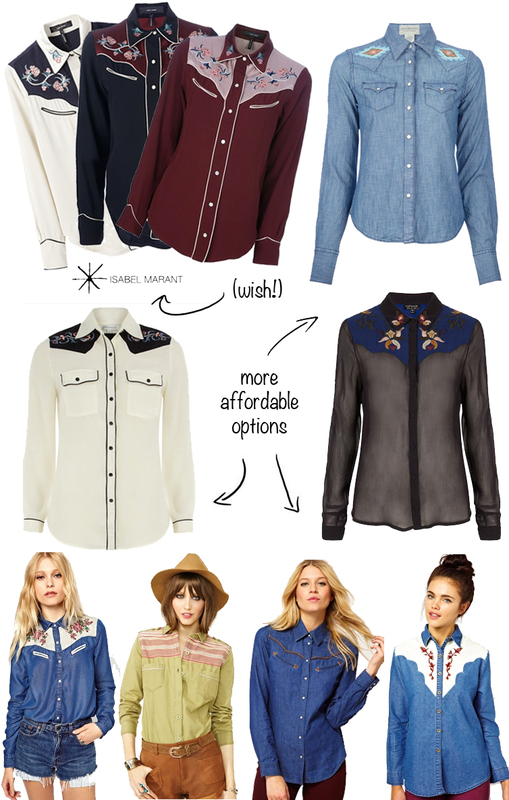 Acne Long Sleeve Blouse. 2. Equipment Slim Signature Colorblocked Blouse. 3. Elliot Rhodes Tan Skinny Leather Belt with Gold Horn Buckle. 4. Linea Pelle Vintage Perforated Hip Belt. 5. Keds Pointer. 6. Mel Shoes We’ll Have a Wiffle Ball Sneaker. 7. Wrangler Jess High Waist Skinny Jeans. 8. Reiss Farrah Slim Straight Leg. 9. Imogene + Willie Elizabeth Straight Leg. Here’s to those of us who can see past the cut to the style beneath! 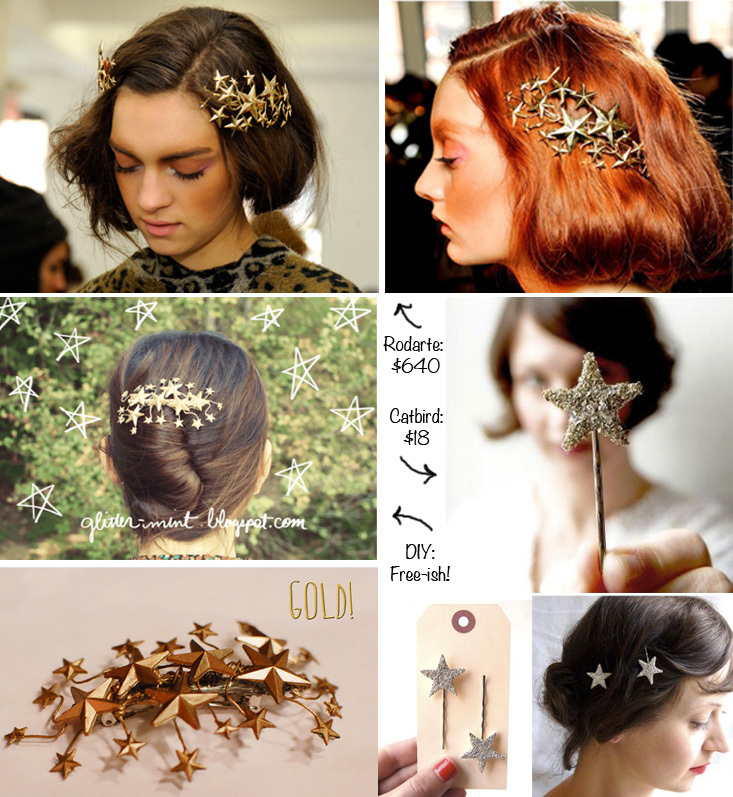 I searched high and low for a star barrette that isn’t cheesy and it wasn’t easy (unlike that rhyme, which was both). Three options. 1) For a mere $640, Rodarte’s gorgeous star barrette could feed a village. 2) For $18, Catbird’s Giant Dwarf Silver SParkler Star Bobby Pins seem like a deal (In comparison, that is. I haven’t bought a barrette since I was four, so I was still under the impression that they’re supposed to cost $2 at most.). 3) Thanks to Glitter Mint’s DIY version of Rodarte’s celestial hair pin, you can probably achieve the look for under $10. Plus you get to use a hot-glue gun. Win-win. 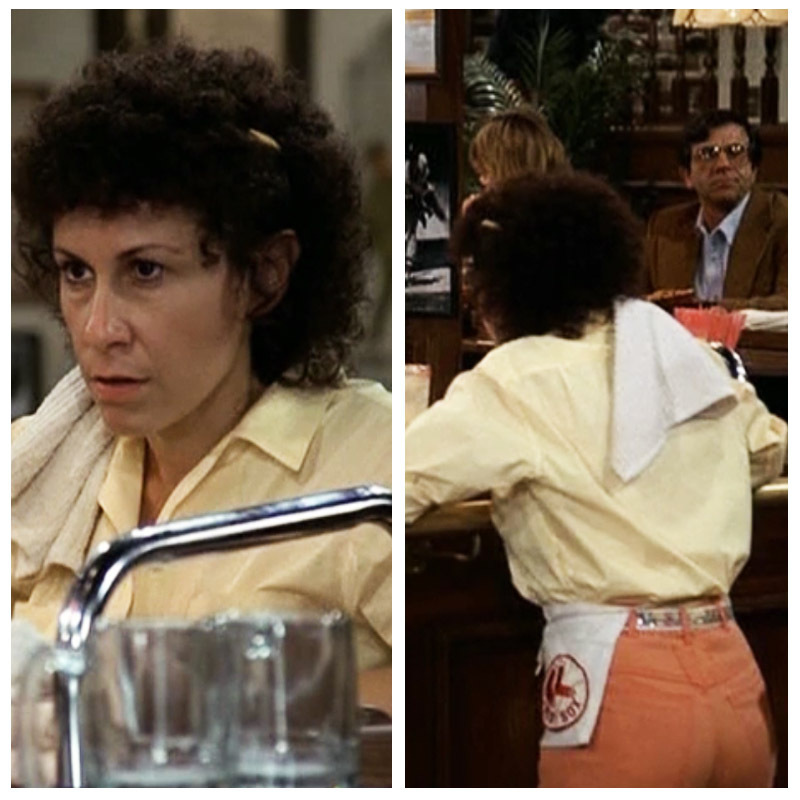 Well, we’ve made it to Episode 3, where I really started to notice just how incredible Carla’s clothes are. It’s very rare that we get to see a full body shot of Carla (she’s usually busy slinging drinks and insults), but when we do, it’s golden. 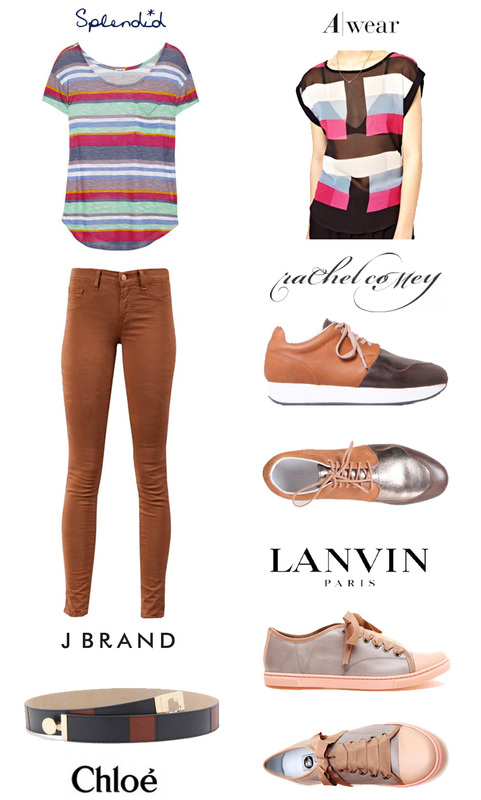 Case in point: this belted rust-colored denim/multicolor-striped-tee/casual sneakers gem. 1. Splendid Striped slub-jersey T-shirt. 2. A Wear Geo Print Button Back Top. 3. J Brand Mid Rise Skinny Leg in bourbon brown. 4. Rachel Comey Corvus sneakers in truffle combo. 5. Chloe Leather Patchwork Belt. 6. LANVIN Contrasting Leather Trainers. Alright, alright. 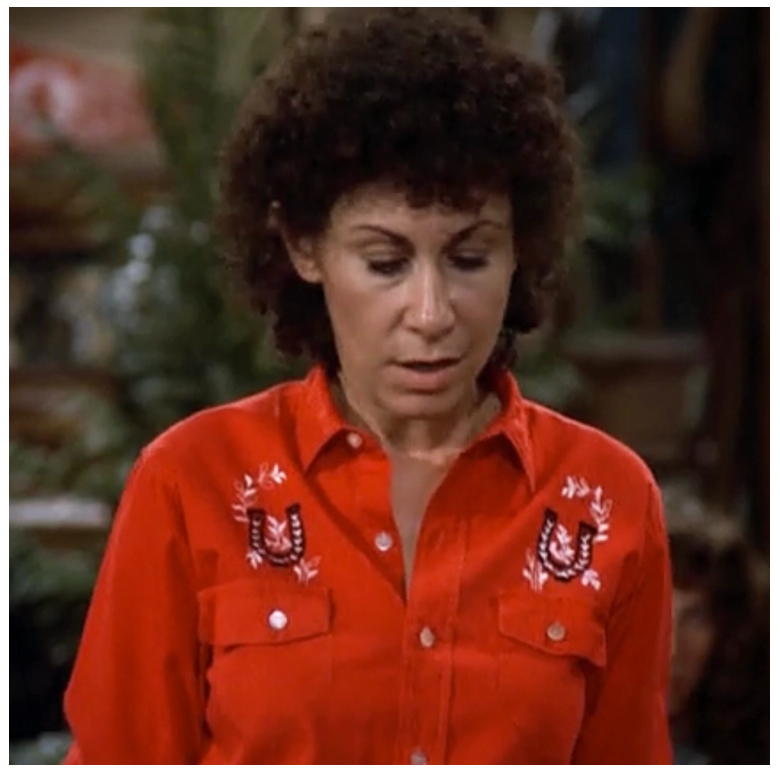 So Carla Tortelli’s outfit in the 1982 pilot episode of Cheers isn’t the best example of her sharp style. But if you can look past the (brillo pad) haircut and unfortunate (mom pant) pleats, this can be easily reimagined as a cute modern outfit. 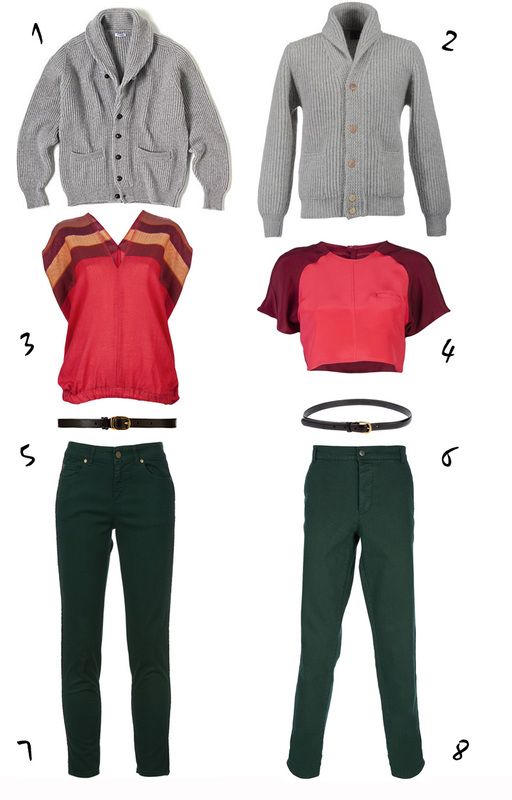 The bones are all there: a chunky oversized knit sweater, an embellished red tee tucked into high waisted colored denim, and a skinny black belt. Update the proportions and it doesn’t feel like the 1982 recession is just beginning. It feels more like, well, the current recession. 1. Drake’s London Iconic Four Ply Cashmere Shawl Collar Cardigan in flannel grey. 2. GRP Cardigan in Grey. 3. LEMLEM Adamu Drape Top. 4. 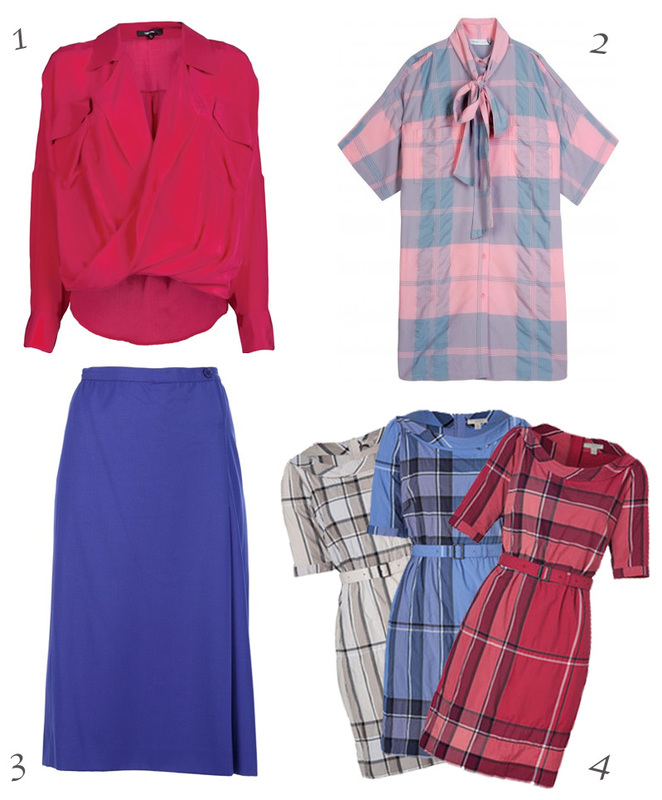 Jasmin Shokrian Seam Blouse. 5. Barneys New York Co-Op Basic Skinny Belt. 6. Labour of Love Black Leather Skinny Belt. 7. Alexander McQueen Skinny Jean in bottle green. 8. Societe Anonyme ‘George’ Unisex Tapered Jean. In the fall of 2012, I moved into my first studio apartment. Then I got sick. I had never lived alone and now I had the flu, to boot. 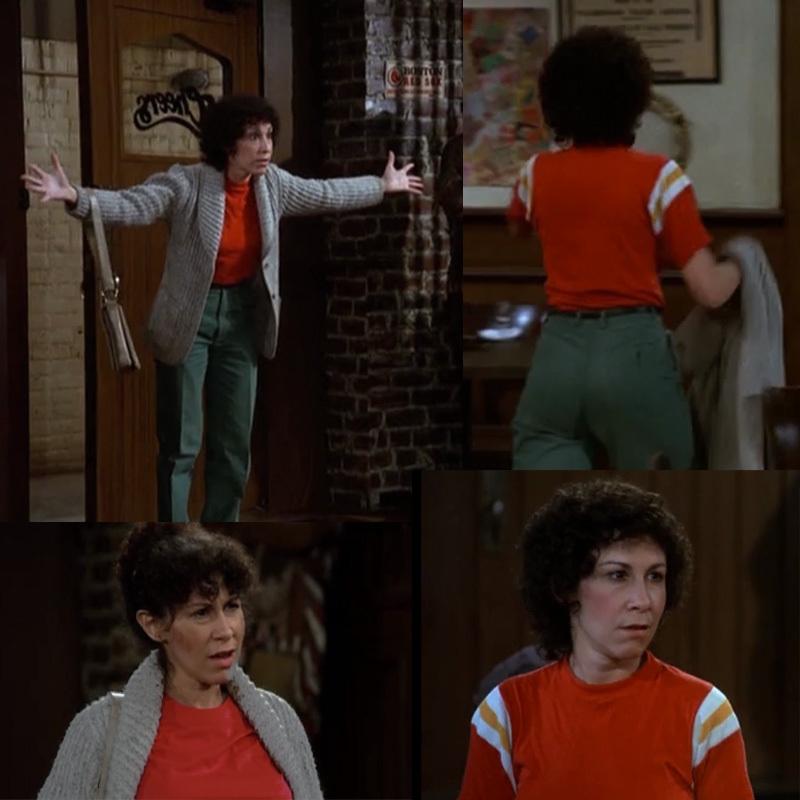 After exhausting all reasonable Netflix options, I turned to Cheers. It was a revelation. 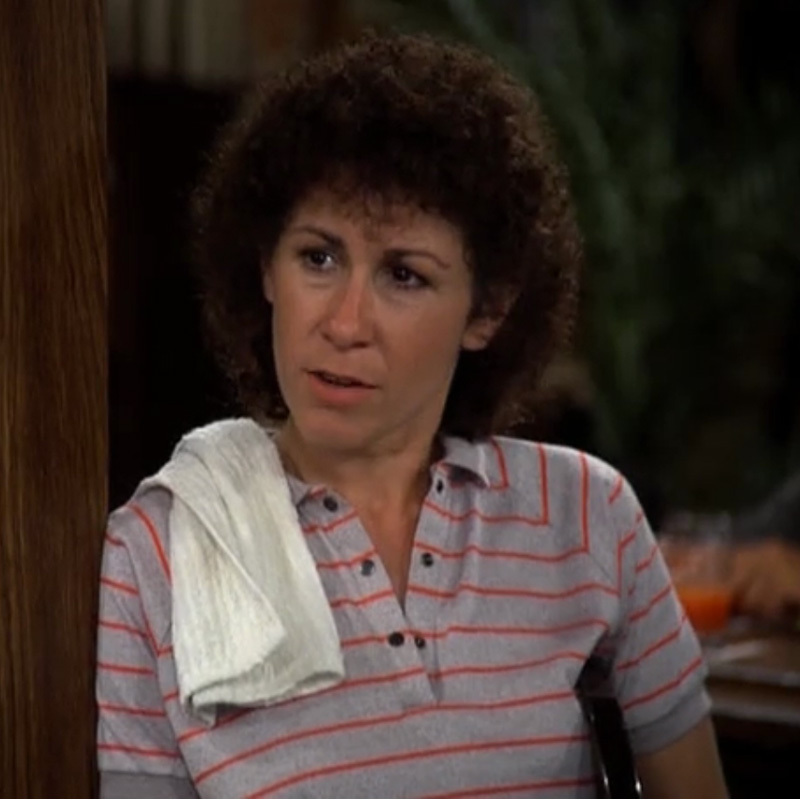 Cheers aired its pilot episode three years before I was born and went off the air when I was in 3rd grade. But, no matter. 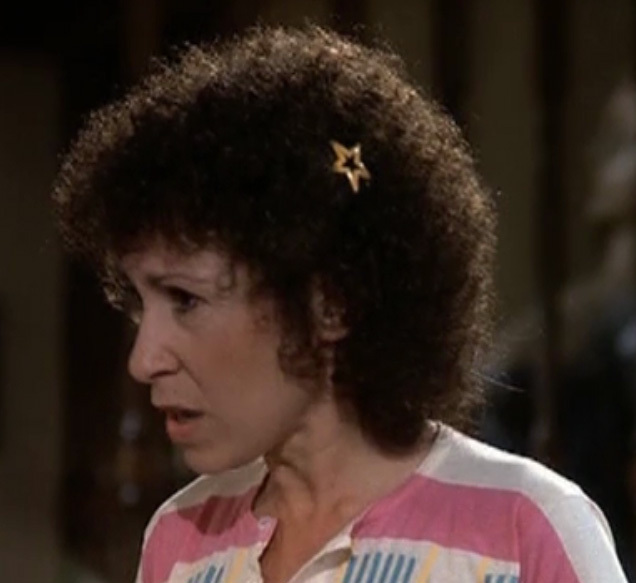 Rhea Perlman’s character Carla Tortelli, with her keen sense of style (read: high-waisted jeans, color-coordinated Nikes and barrettes, and animal-print sweaters), has become, 30 years after her inception, my fashion guru. 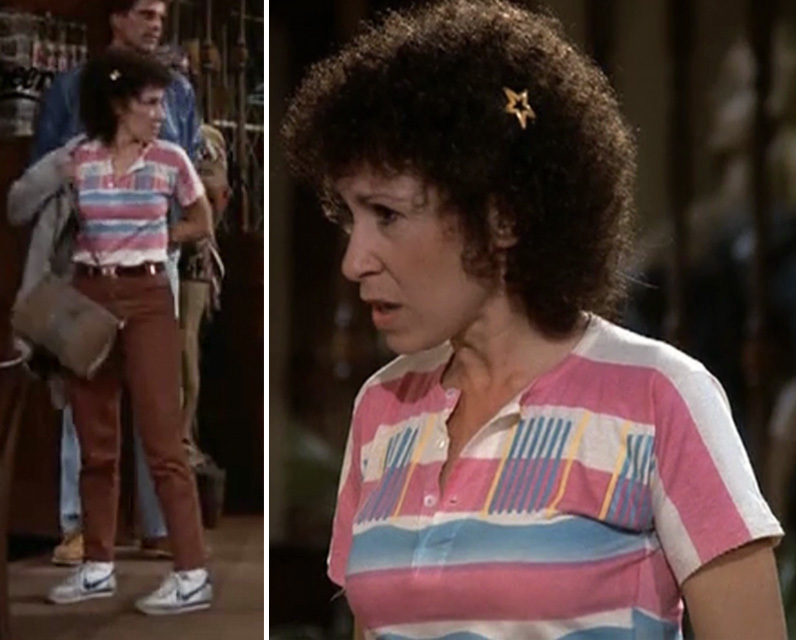 This blog charts the outfits of Cheers’ main characters (with an emphasis on dear Carla, of course), from its pilot episode in 1982 to its finale in 1993. 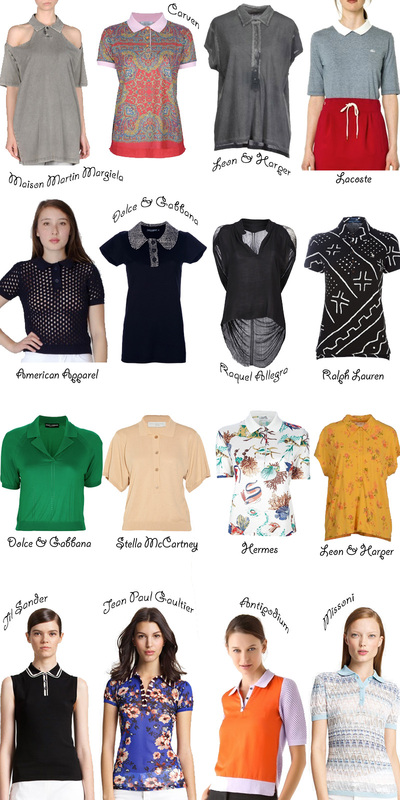 It also points you in the right direction for achieving a modern take on the looks of these underrated fashion icons.